Raleigh, NC, September 05, 2018 --(PR.com)-- Mid-August approached as business leaders nationwide prepared for an annual leadership seminar held at Dallas, Texas’ Hilton DFW Lakes Executive Center. The exclusive, annual conference brings together select top performing men and women from sales and marketing campaigns across the US. It was there that they were provided the opportunity to expand their knowledge on how to maximize their growth as elite business leaders. 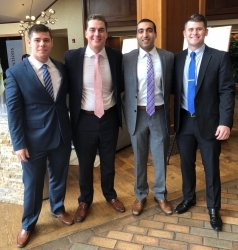 Upon their return to Raleigh, they were granted the opportunity to speak with some of the Acquire team members who had the privilege of attending the educational seminar. Attendees were expected to arrive in Dallas with an intention to learn -- ready to grow. The seminar speakers covered a multitude of topics ranging from, the importance of campaign compliance, culture and team identity, and brand management. Attendees were given the chance to network with other markets, learn more about new campaigns, and encouraged to participate in individual breakout sessions with industry leaders. Zack Schuch, National Director at Acquire was asked to Keynote speak on the abundance of growth in the industry as well as the importance of opportunities to expand into new fields and emerging markets. Acquire’s leadership team left the conference with a new outlook and learned how to see the bigger picture rather than focus on the beginning stages of becoming a better business person. This conference not only helped the attendees find what truly drives their goals but also gave them the tools and motivation to take their goals and see them through to the finish line. To learn more about the Acquire culture as well as their philanthropic efforts, visit their website at www.acquireraleigh.com.